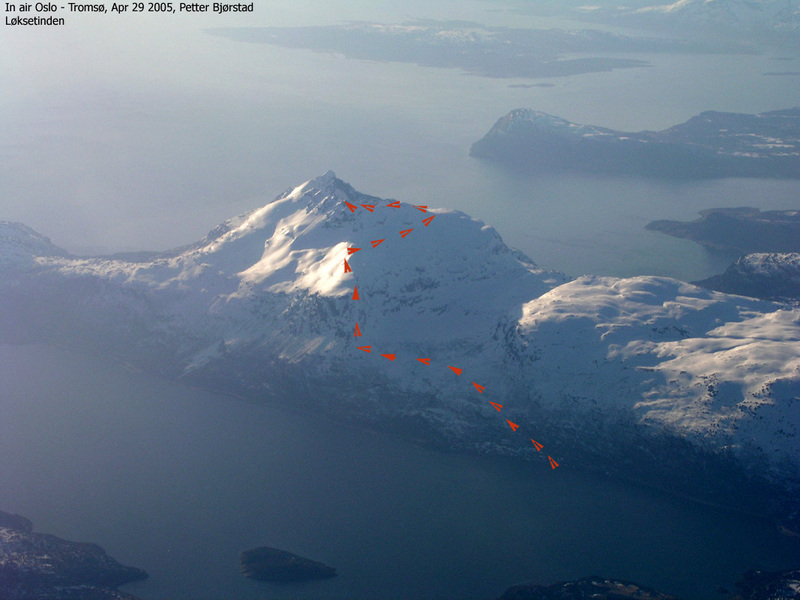 How to get there: This peak is located near the Salangen fjord in South Troms. From Tromsø, drive 73 km on Hwy. E8 to Nordkjosbotn, then follow Hwy. E6 south. After 88 km, you pass the village Setermoen. Continue another 9 km south on E6, then turn right on Hwy. 851 towards Sjøvegan. You reach Sjøvegan 19 km after leaving E6. There is accommodation here, call (+47)77171204. The place also has a nice pub that serves pizza. Contine 10 km north-west along Hwy. 84 (direction Sørreisa) until the road fork where Hwy. 848 (direction Harstad) goes left across a bridge. Drive 4.1 km along this road. Shortly before the trailhead, a road signed Løksa goes left. The trailhead is on a hilltop where you can park the car off the road on your left side. The precise location is north 68:55.647, east 017:38.620, elevation 51 meter. 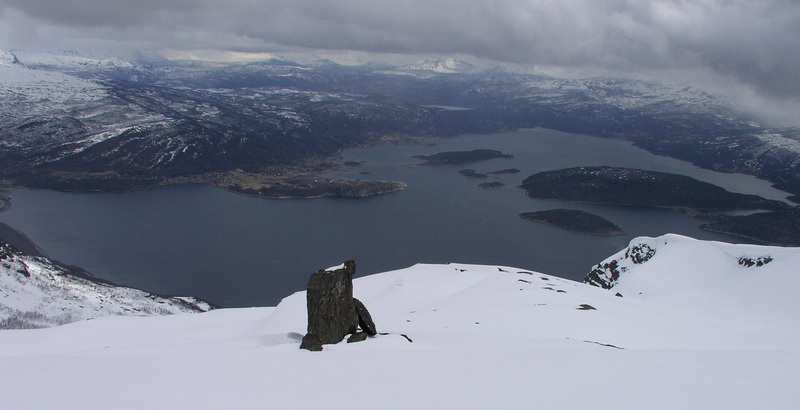 Route description: Note that this description is based on a ski ascent, the nature of this route is likely very different in summer conditions. Cross the road and walk back (to your right) about 75 meter. There is a wooden sign here pointing uphill that reads Løksetinden. A small creek comes down right next to the trail. The trail climbs uphill towards west, it is pretty well marked with red paint, initially on trees, later on rocks, however many such marks were likely hidden by snow when I did this climb. At elevation 300 meter, the trail is more level as it enters and crosses the flat bottom of a nice bowl. The creek Navarselva is then crossed as you approach the ridge Aksla that looms above in front of you. This ridge is the key to access the higher part of the mountain. Find a good line up in order to gain the lower part of the ridge, this is about 100 vertical meter to about 500 meter of elevation. This slope is quite steep and may avalanche in winter. Once on the ridge proper, the route heads straight up. The steepest part is towards the end, here it may be better to stay slightly on the left side of the ridge. In May, there may be some rocks and patches that are free from snow on this side. The ridge tops out and the slope becomes much more gentle at elevation 743 meter. 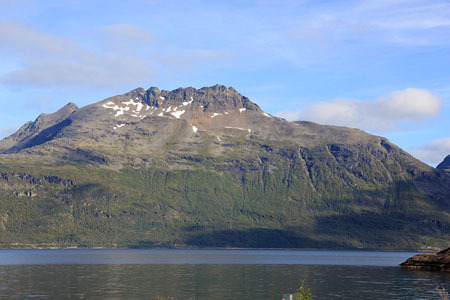 However, the ridge continues uphill and eventually forms the corner between the two main summit ridges of Løksetinden, one running east to west, the other south to north, each about one kilometer long. 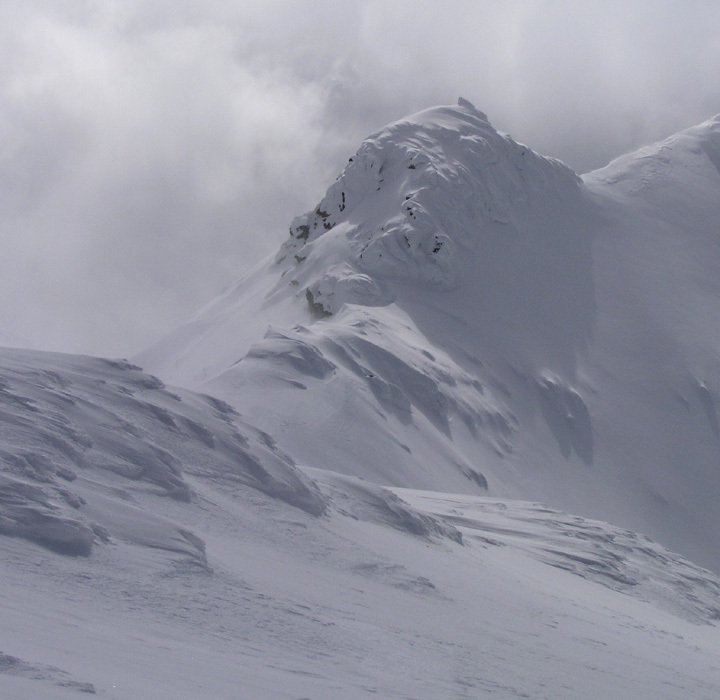 In winter, the Aksla ridge that we ascend, has a big (overhanging) cornice on its right side (the north-east side). When reaching close to 900 meter of elevation, approach this cornice with care and locate a point where the hillside below is less steep and where one can cross down a steep but short slope, this point provides a safe way off the ridge. Exit the ridge here, the access point just below the ridge has elevation 870 meter and location north 68:55.777, east 017:34.434. From here, observe a broad, nice slope that heads north and gently climbs towards the north end of the south-north summit ridge. The route runs close to or slightly higher than a large, very visible rock that is located in this area. This part is easy, gain access to the north ridge slightly above 1120 meter of elevation. From here, turn south and climb to 1200 meter along the ridge, the slope is still wide and quite gentle. From here, a very impressive scenery opens up. The ridge continues south, but now corniced (on the east side), considerably sharper, with a west side that is steep enough to avalanche. You see the apex where the east-west ridge joins the ridge you are on. The M711 map indicates a summit at 1237 meter at the far end (west) of this ridge. The traverse to this point looks far from trivial under winter conditions. I summer, one can most likely stay a bit on the right side of the ridge whenever needed in order to bypass difficulties. However, the good news is that the true summit of Løksetinden at 1242 meter is located where these two ridges meet, that is, considerably closer to your current viewpoint. The bad news, is that even this point looks challenging in winter. 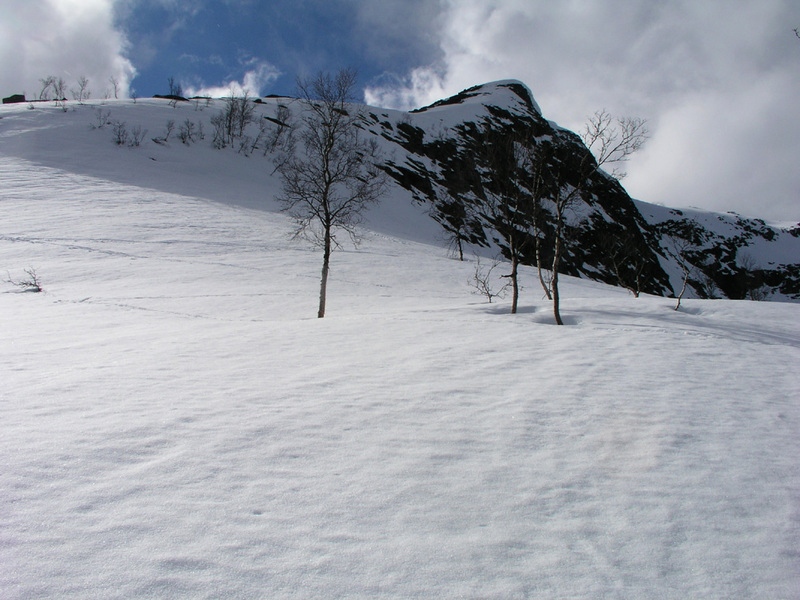 Leave your skis at this point and proceed with ice axe and crampons (depending on the snow conditions). As you get close to the summit block, further progress looks a bit easier than the first impression from further away. Move left and climb back onto the main ridge higher up, then proceed to the cairn. This is almost certainly a lot easier in summer. Return the same way. Comments: I climbed this mountain solo. The conditions were far from perfect. The weather forecast was pretty miserable and turned out to be accurate. Rain, snow showers, hail and clouds providing white-out conditions all combined to make this last T5 climb a challenge. Add to this, the rotten unpredictable snow, sometimes breaking in a way that made falls unavoidable, the general steepness of the route, the huge corniced summit ridge and the final crux climb where both crampons and the active use of an ice axe was required. However, there were several brief breaks in the clouds with sunshine and improved visibility throughout the day. This all combined to a lasting memory of a spectacular finish of T5, exhausting, but worthwhile. I started around 0800, carried the skis to about 180 meter of elevation. I then skied until gaining the Aksla ridge at 500 meter of elevation. From here, I again carried the skis up the steep ridge to elevation 743 meter. From here, I skied up the ridge and off it at the safe spot, then continued skiing until reaching 1200 meter of elevation on the north summit ridge. I had a mix of visibility, mainly clouds (fog), but a few brief moments of sunshine that provided help in finding a good route. 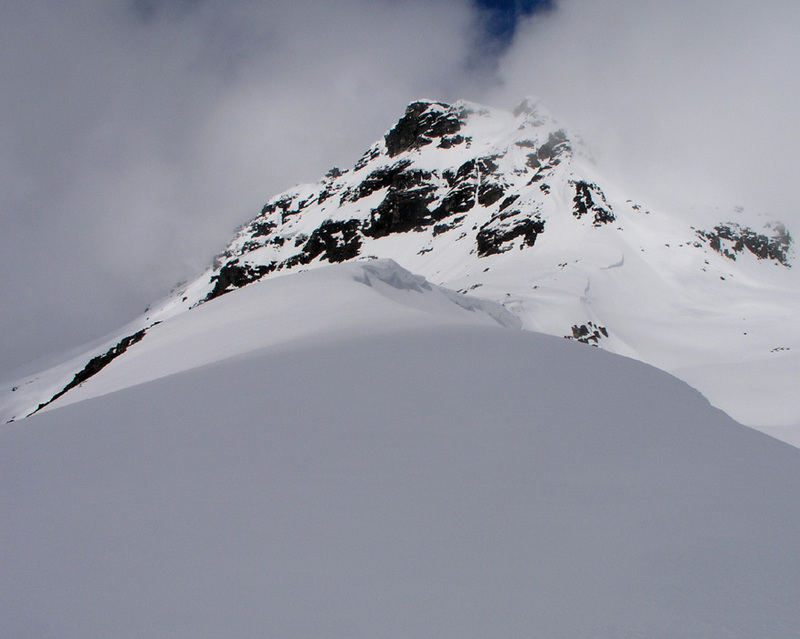 I had expected the north ridge to be a bit broader and, in particular, its slopes much less steep than what I found. At elevation 1200 meter, a break in the clouds revealed the entire ridge system to me and I did not like what I saw. 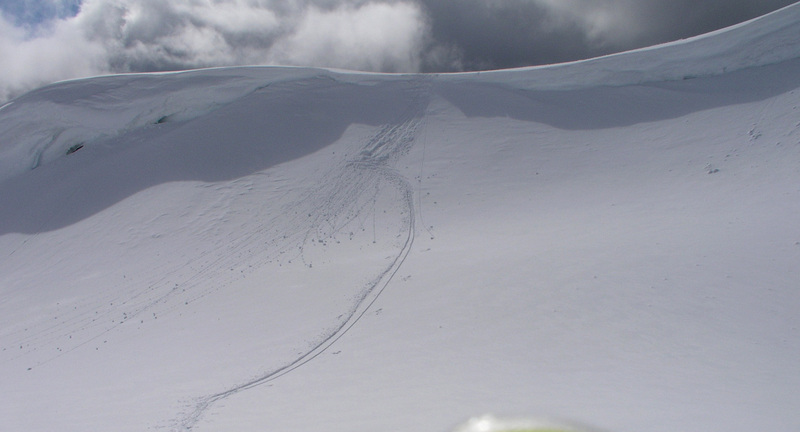 The ridge was narrow, it did not look safe to move off on the west side due to steep, slab snow (avalanche prone). On the east side, continuously overhanging cornices. Further ahead, a vertical looking tower seemingly blocking the way. Pretty exhausted already and with little hope of success, I still left my skis and poles and proceeded to explore the ridge on foot. At the base of the tower (summit block), visibility became limited, but it looked possible to climb. I needed my crampons due to an icy section, but then proceeded to climb with surprisingly little difficulty. I was quite happy when locating the cairn on this summit and confirming the correct elevation of 1242 meter with my GPS. I reached the summit at 1300 after 5 hours of hard work. The descent also required attention as the snow was now even more rotten on the Aksla ridge. I was back at the car at 1600, having a sense of finishing T5 with a peak that was harder work than expected. This route is normally a summer route. In winter, the steepness of the terrain and possible avalanche conditions (I saw several smaller avalanches en route), calls for caution. Only experienced people should consider skiing this route. This was peak number 14, the last peak on my T5 trip. Fourteen peaks all on the Norway 100 finest list of high prominence (one at 996 m, 13 with more than 1000 m), climbed in 14 days. Net vertical climbing 16913 meter, (net difference between trailheads and summits, actual vertical substantially more). Six additional independent (primary factor exceeding 100 meter) peaks were climbed along the way to these giants, so a total of 20 new peaks. 10 peaks climbed in good weather, 3 in clouds and fog, and the last one under very mixed conditions. It is a bit sad and very different from Southern Norway to observe that there are more tracks from snow scooters than from skis. In particular, these noise and pollution generating machines had tracks to all summits that due to gentle steepness could be attained in this motorized way. Officially, the use of these machines is only permitted for work related activities, not for "pleasure", however, the tracks prove that this is largely ignored. The activity was also highest in the weekends and on a public holiday, clearly showing that the local authorities defacto accepts the near unlimited use of these machines for recreational purposes in the general wilderness. Many thanks to Torstein for a great trip on Jiehkkevarri and to Ståle for good company on 6 of the peaks in the first week. T5 was successful beyond any expectations! Go to Previous peak Spanstinden. or return to First T5 peak Jiehkkevarri. View towards Sjøvegan from the lower part of Løksetinden. Aksla as seen from below. It is steeper than it looks. The upper part of Aksla. It is quite flat, but one needs to get off on the right side. On the upper slopes, this rock is a good waypoint. 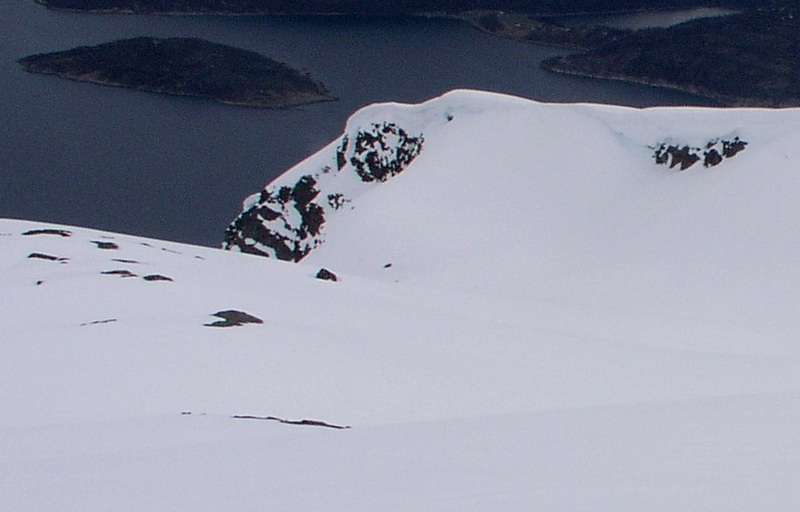 The summit ridge on Løksetinden. Return to the Aksla ridge, first back up on the ridge, then steeply down to the left.